On this page, we will tell a partition program, with which you can move free disk space from D drive to C drive on Windows. 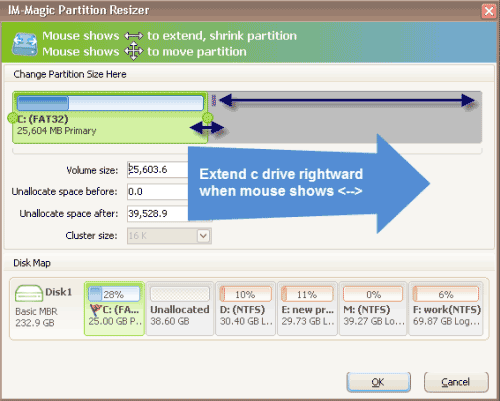 Download IM-Magic Partition Resizer Server to move disk space from D drive to C drive when it is lacking of free space. Free space is needed if you want to store data to a partition. When there is no free space on a partition, you cannot store more data. Even worse, if there is no free space on C drive (system partition), your computer will run slowly. In this situation, you may want to move fee space from other partition like D drive to extend C drive space. IM-Magic Partition Resizer Server is a partition tool, which can work on Windows Servers to resize disk partition by moving free space from one partition to another with original data untouched. Download, install and run IM-Magic Partition Resizer Server. Right click D drive and chose "Resize/Move" option. Move the arrows to shrink D drive, and then you can see some unallocated space. You need to move the unallocated space close to C drive. Then, right click C drive and select "Resize/Move". You may have allocated reasonable disk space to C drive when partitioning the hard disk on your PC, but C drive space has been eaten up by a large number of data such as operating system, programs, Internet files, cookies and caches and more. C drive will run on low disk space when it has no enough free space, which will lead your PC to run under low performance. "C drive only has 5GB free space left on my PC which runs Windows Server 2008 operating system. Today, when I wanted to install a program on C drive, system says that C drive doesn't have enough free space. So I can only install the program on D drive, because this drive still has more than 80GB free space. Although I haven't encountered any trouble due to C drive low disk space, I want to move some free space from D drive to C drive. Can you tell me how do I move the space?" "Windows Server 2003 is running out of disk space on C drive on my computer. I have made every effort to fix the problem, but it is useless. Well, I tried to uninstall some unnecessary programs and I also ran Disk Cleanup to free up space on C drive, but it only released little space. In addition, I tried to run Diskpart to extend C drive on Server 2003, but it says the selected drive cannot be extended. Is there any other way to extend Windows Server 2003 C drive?" When a partition is running out of disk space, the easiest way is to delete everything on the partition, but it will result in important data loss. Especially, you had better not delete data stored on C drive, which may have influence on operating system after deleting. Another solution is to move some free space to extend C drive space instead of deleting files to free up space on C drive. If you want to extend C drive, you should ensure that there is free space on other partition on the same hard disk. In order to move free space from D drive, you need to shrink the D drive to squeeze free space from D drive first of all. The free space will show as unallocated space and then you can add the unallocated space to increase the size of C drive. 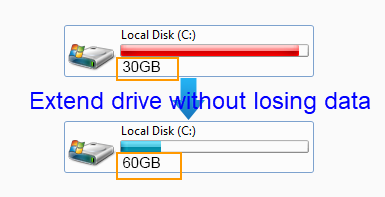 There are different solutions for moving free space from D drive to C drive under different Windows OS. Both Windows 2003 and Windows XP do not have Windows built-in tool to shrink a partition. Although Diskpart under Windows 2003 allows users to extend partition, it cannot extend a system partition. Therefore, if you are Windows 2003 (including Windows SBS 2003, Windows 2003 R2) or Windows XP user, you can rely on IM-Magic Partition Resizer Server to move space from D to C drive. This partition software can work on almost all Windows to resize C drive. Windows XP users can also use IM-Magic Partition Resizer Free, which is free partition software for Windows home users. For Windows Server 2008, 2012 and Windows 7, Windows 8 users, you can squeeze free space from D drive under Disk Management. But you should move the unallocated space close to C drive. Otherwise, you are unable to add the space to C drive. The bad thing is that Disk Management cannot move partition. In this situation, you can also run IM-Magic Partition Resizer to move the partition and expand C drive.